Dark red fabric to cover the back of the neck. All things being equal, we can all agree that it is better to be a powerful sorcerer than not being a powerful sorcerer. When you’ve lived out your entire life as an advisor to a chubby and (admittedly adorably) awkward Sultan, it is really difficult to keep your head on straight. You’re the one with the wisdom and guidance. You’re the one who has given voice to the economy and brought in a number of potential suitors for the Princess and future Queen. But, at the end of the day, you’re sort of pushed of as a joke with only your bird-brained parrot to talk to about your deep desires and ambitions. Who can blame you!? You deserve the power. It was only natural that you’d seek out the powerful lamp of the genie and ask for magic beyond compare! You were already a powerful sorcerer, but… the limitless possibilities of eternity? But, remember to keep your head on straight! Don’t get your ego get the best of you. Too dangerous a wish or too much greed and envy will only bring you down a very restricted path. In fact, here is a trick. Keep this Jafar Headpiece firmly on that noggin of yours and remember each moment: Aladdin is only the hero because he was a nice guy! 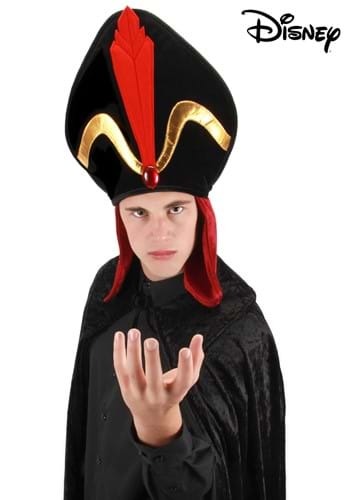 So long as they think you are, too, you can rule the cosmos… and look fantastic with this brilliant black, red, and gold vizier hat while doing so! Its really good material, it also has a resiable option inside so you can make it either bigger or smaller depends what you feel like. also, the original costume of jaffar is coming with a similar hat like this - but it is easily noticeable that this hat is by far - better looking and more comfortable.